Pretty Good Solitaire Mac Edition version 2.44 with 440 games is now available. This update includes adds 20 new games, bringing the total to 440. The new games are Alexandria, Applegate, Breakwater, Brown Recluse, Candike, Cleopatra, Crossroads, Eight On, Eighty Thieves, Forty Bandits, Lancaster, Linus, Microbe, San Juan Hill, Scorpion Tail, Single Interchange, Single Spark, Suits in Line, Swiss Patience, and Three Blind Mice. It also adds two card sets to the basic download, the Traditional Card Set and the Large Suit Card Set. These were formerly extra downloads. The Mac Edition runs on OS X version 10.4 or later - including Snow Leopard, Lion, and Mountain Lion. It does NOT run on iPads, iPhones, or iPods. 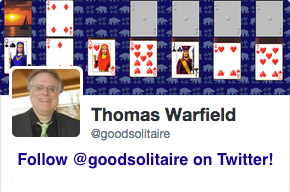 Download the TRIAL version of Pretty Good Solitaire Mac Edition from http://www.goodsol.com/mac/download.html . The trial version is limited to game numbers 1 to 30 of each game, while the full version has over 2 billion game numbers for each game. If you are a paid user with the FULL version, simply run your installed full version. Go to the Internet menu (note that the menus are located at the very top of the screen with the Apple logo on the left and the date/time on the right). Select "Download Latest Version" from the Internet menu. The new version will begin downloading. If you do not have the full version already installed, you can download from the link in your receipt email (the email you received after your order with your registration code). If you don't still have this link, email me at support@goodsol.com to have it sent to you again. 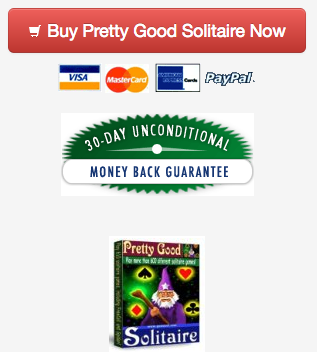 Pretty Good Solitaire Mac Edition is US$24.95. You can order online from http://www.goodsol.com/mac/orderonline.html . After your order you will get an email with a link on where to download the full version and a registration code. Registered users can submit scores to the web site and you get free upgrades to new versions through 2015. Download the Valentine's Day Card Set from http://www.goodsol.com/downloads/cardsetvalentine.html . Both Windows and Mac versions of the card set are available. The Valentine's Day Card Set works in any full version of our games. This game is at Eight On.